Little Green Men - Attack! Book three in the nationally best‑selling Manticore Ascendant series, a prequel series to David Weber's multiple New York Times best‑selling Honor Harrington series. Sequel to A Call to Duty and A Call to Arms. After the disastrous attack on the Manticoran home system by forces unknown, the Royal Manticoran Navy stands on the brink of collapse. A shadowy enemy with the resources to hurl warships across hundreds of light years seeks to conquer the Star Kingdom for reasons unknown, while forces from within Manticore’s own government seek to discredit and weaken the Navy for reasons very much known: their own political gain. It’s up to officers like Travis Long and Lisa Donnelly to defend the Star Kingdom and the Royal Manticoran Navy from these threats, but the challenge is greater than any they have faced before. Weakened but not defeated, the mercenary forces and their mysterious employer could return at any time, and the anti‑Navy faction within Parliament is growing. The situation becomes even more dire when fresh tragedy strikes the Star Kingdom. While the House of Winton faces their enemies at home, Travis, Lisa, and the other officers of the Royal Manticoran Navy must reunite with old friends and join new allies to hunt down and eliminate the forces arrayed against them in a galaxy‑spanning conspiracy. Manticore has learned that the universe is not a safe place, but the Star Kingdom’s enemies are about to learn a lesson of their own! THE EXILED LEADER: He was known as the Butcher of Jonasport. Zander Krycek made a choice that saved his world of Ithaca, but doomed his reputation and banished him to a planet far, far away. THE EVIL EMPIRE: The Orlov Combine intends to swallow Ithaca in the same way they have devoured so many worlds, creating a “company planet” where the residents are little better than slaves. THE DAUGHTER: Adisa Masozi never knew her father, but was taught he was a monster. Now she must reclaim her father’s legacy of leadership. And the place to start is with the mysterious aliens who also inhabit Ithaca. THE NATIVES: The saurians have held themselves aloof from galactic politics for eons in order to regain the strength to exact their revenge on an ancient foe. They have the means to resist the Combine. If they can be convinced to help. THE PRIVATEER: Enter privateer Captain Catherine Blackwood and her ship, the Andromeda. Blackwood and her crew have handled dangerous cargo and dicey situations before. Now, they’ll have to navigate assassination attempts, warring factions, and civil unrest. But Catherine has made a promise, and the freedom of a world hangs in the balance. The Privateer Andromeda series continues! Boomers. Ships of the Line. Star Destroyers. The bigger the ship, the better the bang. From the dawn of history onward, commanding the most powerful ship around has been a dream of admirals, sultans, emperors, kings, generalissimos, and sea captains everywhere. For what the intimidation factor alone doesn’t achieve, a massive barrage from super-weapons probably will. Thus it was, and ever shall be, even into the distant future. From the oceans of Earth, to beneath the ice of Europa, to the distant reaches of galactic empires, it is the great warships and their crews that sometimes keep civilization safe for the rest of us—but sometimes become an extinction-level event in and of themselves. In “Superweapon” by David Drake, a fight for possession of an ancient alien warship will determine the fate of two vast interstellar powers. Then in “Hate in the Darkness” by Michael Z. Williamson, a team of libertarian Freeholders must think outside the box to do battle with the might of the United Nations and its powerful navy. And in “A Helping Hand,” Jody Lynn Nye posits an interstellar submarine on a rescue mission behind enemy lines—with the fate of an entire species hanging in the balance. Big, bold, and edge-of-your-seat space opera and military science fiction from David Drake, Sharon Lee & Steve Miller, Michael Z. Williamson, Steve White, Robert Buettner, Susan R. Matthews, Dave Bara, and many more! THE FREEHOLDERS RETURN in Book 7 of the nationally best‑selling Freehold Universe series. A return to the libertarian world of Grainne and its battle against an Earth government that will not let the Freeholders remain free! Angie Kaneshiro never planned to be a spy. She was a veteran of the Freehold Forces of Grainne, and was now a tramp freighter crew‑woman who hadn’t set foot on the dirt of a world in ten years. Angie was free, and that was the way she liked it. Then the war with Earth started. One thing Angie knew was human space. She knew where the UN troops garrisoned, the methods they used to scan and chip their own to control them. Even better, she had a mental map of the access conduits, the dive bars, and the make‑out cubbies people used to get around restrictions. The UN forces may hold most of the stations, the docks, and the jump points, but now the Freehold of Grainne has its own lethal weapon: Angie Kaneshiro. The Intelligence branch sends a freighter crewed with Blazers, special forces troops. All Angie has to do is lead them through the holes. Responsibility for the explosions and wreckage will be theirs. But war is complicated, and heroes can be forged in its crucible—even if the hero turns out to be a tramp freighter crew‑woman determined to fight for the freedom she loves. A STUNNING BAEN BOOKS DEBUT. A brilliant Americana flintlock fantasy novel set in a world of Appalachian magic that works. Sarah Calhoun is the fifteen‑year‑old daughter of the Elector Andrew Calhoun, one of Appalachee’s military heroes and one of the electors who gets to decide who will next ascend as the Emperor of the New World. None of that matters to Sarah. She has a natural talent for hexing and one bad eye, and all she wants is to be left alone—especially by outsiders. But Sarah’s world gets turned on its head at the Nashville Tobacco Fair when a Yankee wizard‑priest tries to kidnap her. Sarah fights back with the aid of a mysterious monk named Thalanes, who is one of the not‑quite‑human Firstborn, the Moundbuilders of the Ohio. It is Thalanes who reveals to Sarah a secret heritage she never dreamed could be hers. Now on a desperate quest with Thalanes to claim this heritage, she is hunted by the Emperor’s bodyguard of elite dragoons, as well as by darker things—shapeshifting Mockers and undead Lazars, and behind them a power more sinister still. If Sarah cannot claim her heritage, it may mean the end to her, her family—and to the world where she is just beginning to find her place. From Hugo‑nominated editor Bryan Thomas Schmidt and Nebula nominated author Robin Wayne Bailey, here are nineteen top‑notch science fiction stories guaranteed to make you think -and‑ laugh, featuring such major writers as Robert Silverberg, Mike Resnick, Allen M. Steele, Esther Friesner, Elizabeth Moon, Seanan McGuire, Jody Lynn Nye, James Gunn, Kristine Kathryn Rusch and many more. From the far reaches of outer space they come—inscrutable aliens, malicious invaders, wacky tourists from another planet—to conquer, study, and tickle us. From the battlefields of the Ozarks to the marble halls of the Boston Library, from Central Park to the skies above Washington, on the moon and in the seediest bars of Kansas City—they’re here. But do they really know who they’re up against? Not hardly! Welcome to the hottest pocket in Larry Niven’s Known Space: the time of the assault on pacifist humanity by berserker felinoids from the planet Kzin. 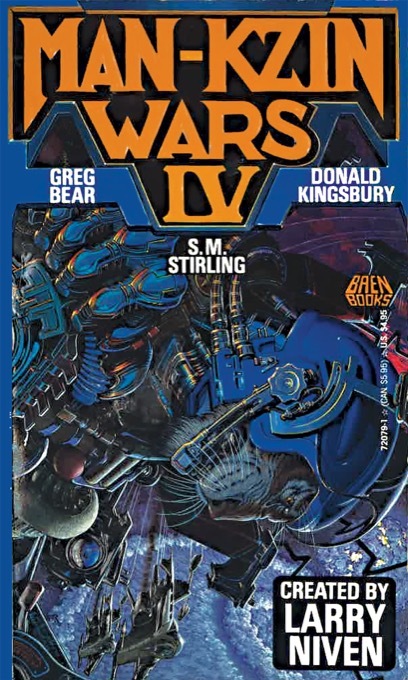 This time humanity’s representatives to the Warrior Race are Donald Kingsbury, Greg Bear, and Steve Stirling. As is traditional in this war for species survival, in all cases “monkey cleverness” (i.e., human cunning) is more than a match for felinoid ferocity. But as is also traditional, victory never comes cheap to those out on the sharp edge of The Man-Kzin Wars.